Soak the dried peas (or other dried legumes, such as lentils) over night, wash and cook them the next day. Note: Some say soaking is not necessary with peas and lentils, I do it. If you have never prepared dried legumes before, simply follow the instruction on the package. Why am I using dried legumes? Simple! They are just a lot less expensive than their fresh or frozen versions, bust just as good. Calculate the amount of calcium needed. Calculate the amount of daily food to be bagged. 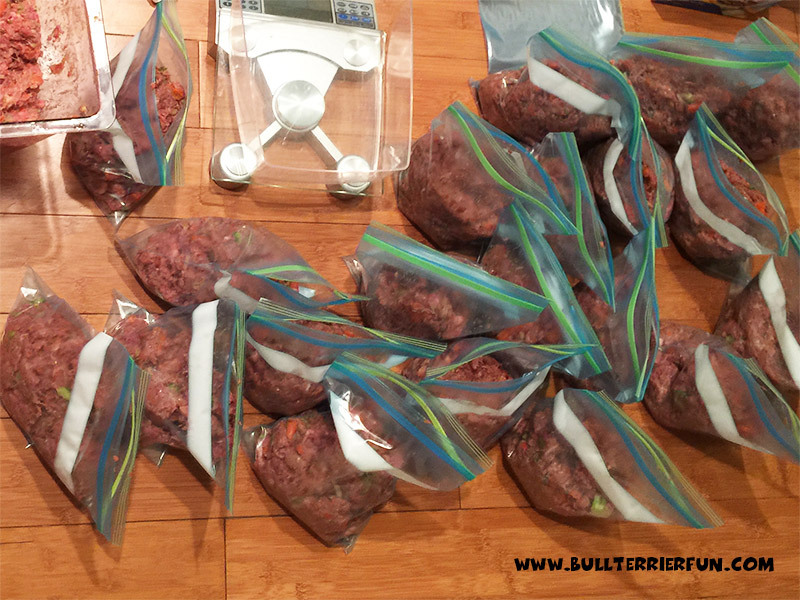 Make sure there is enough space in your freezer for up to 45 freezer bags with food or roughly 60 lb. Let the peas cook until they have absorbed the water and have turned into pea mush. When you cook legumes for your dog, always make sure they are cooked long enough and mushy. This aids your dog’s digestive system to break down the nutrients and absorb them while half cooked legumes pass your dog’s bowels almost unchanged. Cut or break the veggies into rough chunks and cook them until they are ready to be mixed into a food mush. They do not have to fall apart, but should be soft enough for you to squeeze and split them with your fingers to make your mix. Use as few water as possible to help prevent the vitamins from washing out. Let all of your veggies cool. Note: Find more information on why the vegetables should be cooked in my FAQ section under “Homemade Food and Treats”. Just letting you know. You can handle this as you like.Wash the shells and grind them in a porcelain mortar or a coffee grinder. Mix the liquid or cooked and cut eggs, powdered shells, garlic, the weighed limestone powder (or bone meal) and other add-ons, if you use them, such as ACV and vitamins. If you need some more moisture to mix it properly take the broth from the cooked veggies. Just don’t make it too mushy because the food will loose parts of this moisture later and become watery. Grind or cut the liver. As an option you can first cook and then grind or cut it. Mix the soft veggies with your egg-premix and the ground liver. This is the most disgusting part in the otherwise pretty appealing process of the food preparation. The liver almost becomes a viscous mass that does not smell too good. Premixing it into the eggs and veggies helps to take away the odor and feel of it. Grind the meat and the chicken hearts (can be mixed already) or use ground meat and your knife for the innards. As an option you can cook the chicken hearts before processing them. Now combine your egg-egg shell-veggie-calcium-garlic-liver mix with your meat-chicken heart mix to an even dough-like mix. 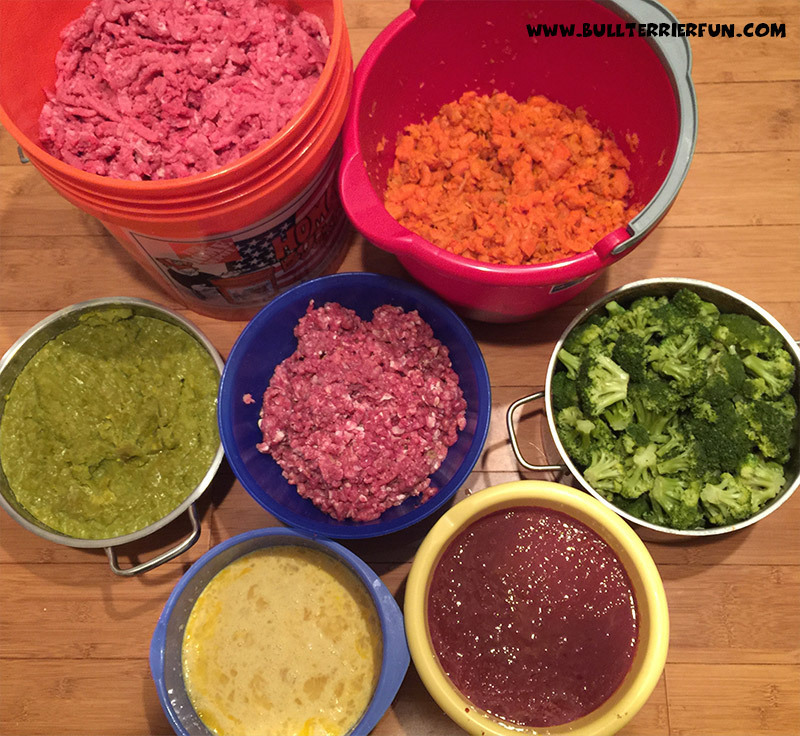 Do that very carefully to distribute all ingredients evenly in the mix. Now you are ready to fill your freezer bags or containers. Use your kitchen scale and the spoon to bag the daily amount you have calculated before. Press the food dough a little until it completely fills the bag. Ty to remove as much air as possible because that helps prevent freezer burn. The result is a flat, sealed portion that can be easily stacked for storage in your freezer and is easy to split for feeding. Your Bull Terrier will just looooooove his food!